In BI 4.0, the Activity Universe, which was used for years as the source for auditing users and system activities in business objects, was discontinued. And while initially 4.0 shipped with no auditing reporting solution, SAP developers stepped up and produced auditing universe for several platforms (audit databases). While their efforts are much appreciated, trying to use the audit universe against an oracle database proved to be not as trivial as the four lines of instructions provided with the sample. In particular, it looks like changing the connection from the sample connection provided in the sample to the real database connection, leaves behind an owner reference on all the tables in the data foundation that causes all kinds of havoc and errors.. To resolve, be sure to change the owner name to the proper owner after changing the universe connection to your own, to assure all the database objects references in the DF can be found.. 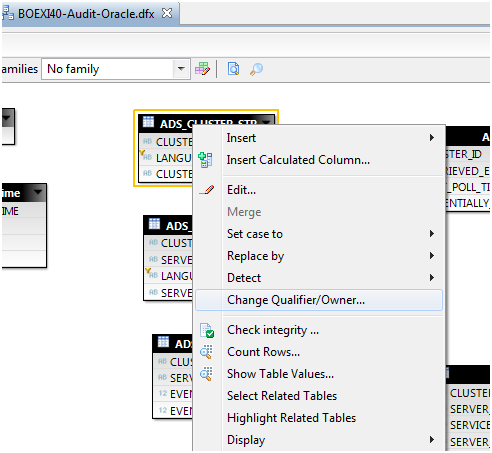 This entry was posted in BusinessObjects 4.0 and tagged BusinessObjects 4.0 Oracle Audit Universe. Bookmark the permalink. The connection is using the same d/b user that owns the tables, and I have logged into the IDT as ‘administrator’. 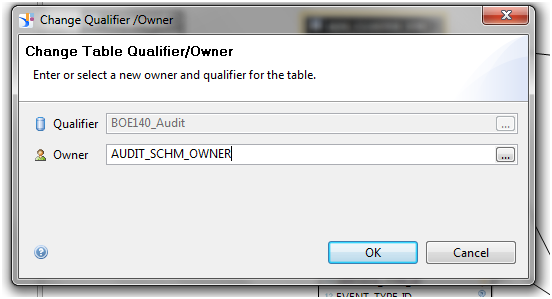 The only peculiar thing I can see is the Qualifier is grayed out and set to ‘BOE140_Audit’. Any idea what is happening here? I can definitely query the data from TOAD using the same user. Hi Sukh, thank you for your comment. 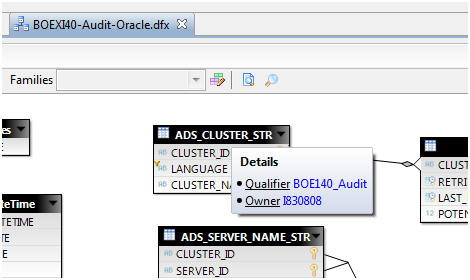 Are you able to change the qualifier from BOE140_Audit to the correct database user? Ron, my understanding is the Qualifier is the name of the Oracle database and the Owner is the Oracle schema. So I have fixed the latter, but I am unable to fix the former because it is grayed out. Do you know how to change this because it is obviously wrong (should be ‘XI4DEVL’ for me, not ‘BOE140_Audit’)? If I compare with tables in a data foundation I have created from scratch, neither of these 2 fields contain a value. Why don’t you try to create a new connection based on your DB info and replace the .unx connection with the one you create? I have done that already – I created the connection in the Audit Universe project, and attached the connection to the Data Foundation. Despite doing this, the individual tables in the Data Foundation still reference the old d/b name in their Qualifier! I believe we are on BI 4.0 SP5 Patch 5. And yes, I am using exactly the right-click option you mentioned. There is one glaring flaw in SAP’s design. They made the Details a Derived View. So, when you use any objects from there, it has to create a temporary view on the DB before using it. For us that’s a huge performance hit since the Details have grown to 350Million rows or about 80GB. They only did it to CAST the DETAIL_VALUE as a VarChar. You may want to use the original table and just CAST the object in its SQL, or create Materialized views for each piece of data like Universe Name or Size so it is much faster. For small repositories, you can leave it as is.